A vision of our wonderful past. In 1889, one year after the opening of Children’s Quarter in Golden Gate Park, George M. Murphy, manager of the Lodge and playground, reported to the Park Commission that the operation was so successful that they had shown a profit of $406 which was placed in the Park Fund. Commission President Robert Hammond, a cousin to William Hammond Hall, proposed that the profits be used to arrange a grand May Day program. His program was ambitious. The day was to be exclusively for children, and all public-school children under twelve were invited to attend with their teachers. They would crown a May Queen, have a spring chorus of public-school children, a Maypole dance, foot races, baseball and other amusements for the children and, of course, the Park Band would play. Each teacher was to designate one girl under twelve to serve as Maid of Honor. From this group, the queen would be selected by lot. The Commission gave the proposal full support. At the first May Day Celebration, the Examiner described the park as a giant goat ranch, because at least 10,000 “kids” filled the Park. By 9AM every streetcar headed to the Park was overflowing. The Grassy slopes near the children’s quarter were transformed into a mosaic of brightly colored outfits. The merry-go-round had to be stopped as the crush of children posed a threat to the younger ones. 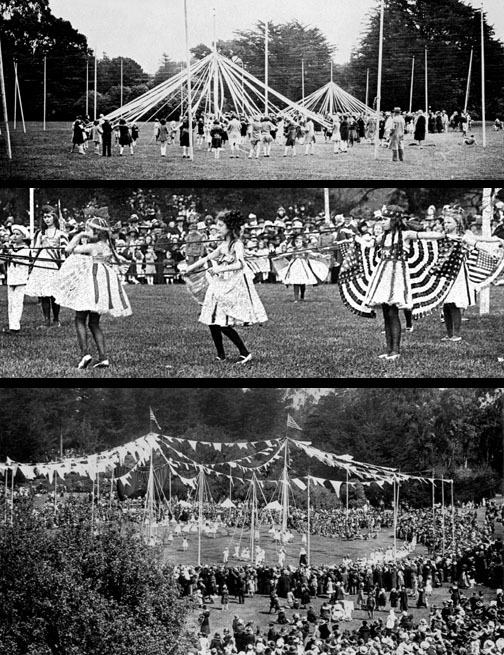 After the May Queen was crowned and processed with her maids of honor, the May Pole dance was completed and then came the games: tricycle, sack, and three legged races, with prizes for each winner. The Evening Bulletin estimated the crowd in excess of 15,000. Whatever the number, all agreed that it had been the grandest day for children in the history of the city. So began a tradition that continued in excess of fifty years. For 19 years between 1911 and 1930, Mayor "Sonny Jim" Rolph never missed the opportunity to place the crown and then kneel humbly at the feet of the new May Queen and gallantly kiss her hand. After this, John McLaren on occasion would perform this solemn duty. Today the closest thing to the May Day celebration is the annual Hara Krishna festival.